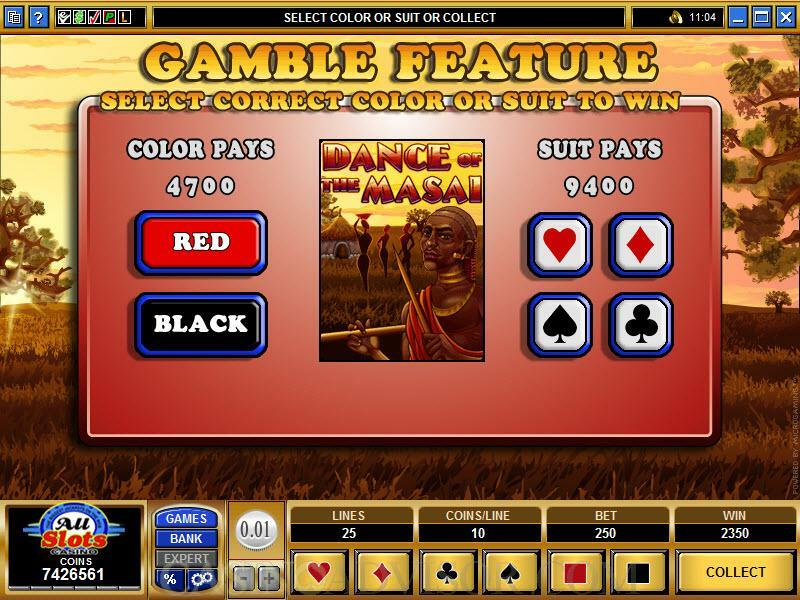 Dance of the Masai is a 5 reel and 25 payline online slot game from Microgaming. It evokes the spirit of Africa and in particular of the famous Masai Tribe. Therefore the wild symbol is appropriately the Masai Warrior. The scatter symbol is the Tree. Other symbols include the Giraffe and the Deer that share space with the Masai. The Hut and the Shield are also symbols on the reels. High card value symbols from Nine to Ace are crafted in a colorful woodcut style. The reels are set against the background of the African plains. Miniature silhouettes of the Masai tribe are placed on top of the reels. The background music recreates tribal melody. Only the Warrior and the Tree symbols show animations. The rest of the symbols only flash when they are in winning combinations. The Warrior breaks into the Dance of the Masai with suitable music. In the scatter symbol a lion strides past the tree. 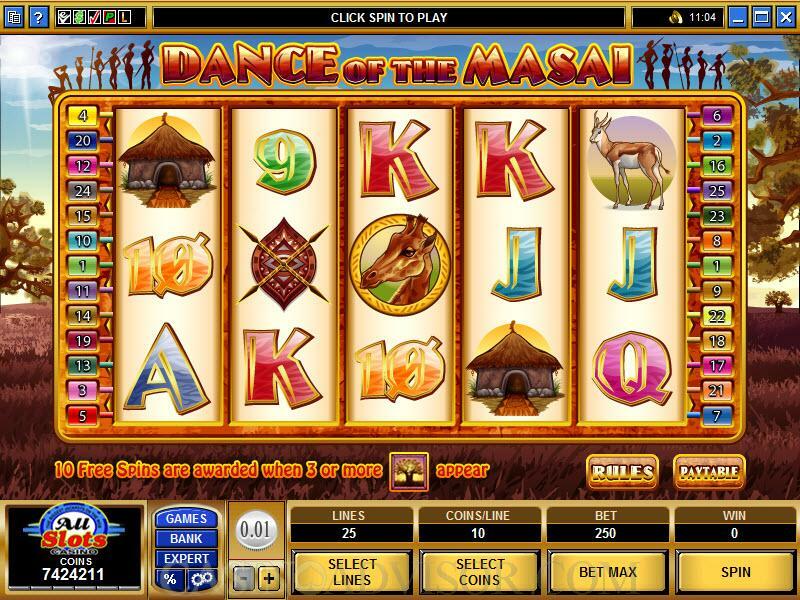 Dance of the Masai has 25 paylines and allows players to wager up to 10 coins per payline. The coin sizes on offer are 0.01, 0.02, 0.05 and 0.10. 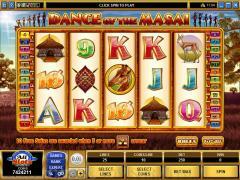 The maximum bet per spin works out to only 25.00 and therefore this slot game is unlikely to attract high rollers. The betting options can be selected in the usual manner by clicking the buttons bellows the reels. The Bet Max button can be used to enable all paylines with 10 coins per payline. The Warrior is the wild symbol. It appears only on reels 2 and 4. It does not act as a multiplier nor does it substitute for the scatter symbol. The Tree is the scatter symbol. Scatter payouts result when two or more Tree symbols appear anywhere on the reels. The free spins feature is triggered when three or more scatter symbols appear anywhere on the reels. Though only 10 free spins are offered the pay outs can be very high due to the role played by wild symbols during free spins. If the Warrior substitutes in a winning combination only on reel 2 then the payouts are doubled. If the Warrior substitutes in a winning combination only on reel 4 then the payouts are quadrupled. If the Warrior substitutes in a winning combination on reel 2 and reel 4 then the payouts are multiplied eight times. During the free spins there is a Warrior Special Substitute feature as well. When the warrior appears anywhere on reels 2 or 4 it expands to cover all three rows. This is accompanied by an animation of the full length Warrior figure performing the Masai dance. The payouts are calculated with the expanded wild symbol. 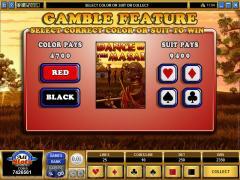 After each payout the player has the option to play the Gamble Game in which he can try to double the payout by guessing the color of the card or quadruple the payout by guessing the suit of the card. If the player guesses incorrectly then the payout is lost. Interested in reading more detailed information about Dance of the Masai? If so Click Here for more details.